Enhance children's dramatic play with their favorite highway signs! 30" tall pole and sturdy non-tip, newly expanded base with adjustable sign height to accommodate all children. Weatherproof plastic base, pole and sign tops are perfect for outdoor play! Provides exciting, active playtime while teaching safety through sign recognition. 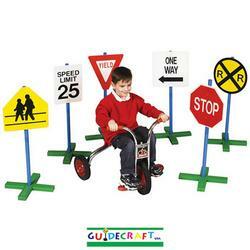 Set of 6 includes Stop Sign, Speed Limit 25, Railroad Crossing, Yield, School Crossing, and One Way. Weight 10 lbs. Method of shipping is UPS Standard.